The Drudge Report linked to a story about China attempting to create the world's first "artificial sun." The People's Daily Online, a state run Chinese website claims that the project could create an infinite amount of energy. being undertaken by the Hefei-based Institute of Plasma Physics under the Chinese Academy of Sciences. It will require a total investment of nearly 300 million yuan (37 million U.S. dollars), only one fifteenth to one twentieth the cost of similar devices being developed in the other parts of the world. What is interesting is that there have been other Tokamak fusion devices created. The US Department of Energy has been funding one at Princeton for almost two decades. The Tokamak Fusion Test Reactor (TFTR) operated at the Princeton Plasma Physics Laboratory (PPPL) from 1982 to 1997. TFTR set a number of world records, including a plasma temperature of 510 million degrees centigrade -- the highest ever produced in a laboratory, and well beyond the 100 million degrees required for commercial fusion. In addition to meeting its physics objectives, TFTR achieved all of its hardware design goals, thus making substantial contributions in many areas of fusion technology development. Of course, with China, it begs to question how much of this "break through" of theirs is actually theirs? It can be summised that a large proportion of China's project is based on American technology. All that I can say is that when one plays with fire, they can get burned. I hope China takes more precautions when they are playing with the sun than they did when they play with chemicals. 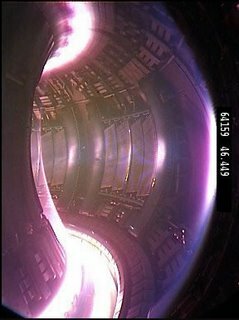 BTW, the two pictures at the top of this post are from two different Tokamak Fusion Reactors. The one on the left is the American one, the one on the right is the Chinese one. As you can see, the basic structure is very similar. The American one has been around since the middle '80s and the Chinese one is "the world's first". I am not a nuclear scientist, so if any read this site, please explain the difference between the Princeton reactor and the Chinese one.